Big robots. Big monsters. Neither have had much critical success on the big screen in recent years. Put the two together and you could just be doubling up the level of fail. But under the skillful direction of Guillermo Del Toro? Well, that’s a different story... a different movie. Del Toro’s PACIFIC RIM has, for some, become the darling of the 2013 Summer film season. It’s a movie that turned out to be just what it was promised to be... and even what it was marketed to be. What a concept! While this would have been enough to put an untainted smile on my face, PACIFIC RIM even went a bit further. It actually features a personality of its own and delivers a character or two to care about, which sadly can’t be said for all that many of it’s contemporaries. Composer RAMIN DJAWADI may best be known for his memorable theme for GAME OF THRONES, but caught ears (for better or worse) with his rock-and-rolly original score for IRON MAN back in 2008. 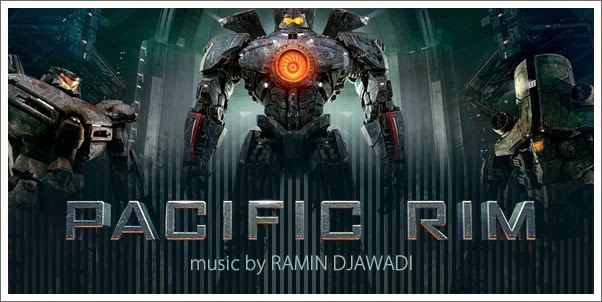 I happen to think it was very much for “the better.” Djawadi’s score for PACIFIC RIM is, in part, the spiritual successor to IRON MAN. His title theme, featuring the distinctive guitar work of Tom Morello (Rage Against the Machine), is the only track you’ll need to hear to make the connection. But you shouldn't stop there...go on and listen to more ... of both scores.